The coming summer months are the best time for cool drinks and the fiery flavors of Tex-Mex foods. Many of the ingredients can easily be grown in your garden, even if you don’t live in the Lone Star State. Here are seven herbs that provide just the right kick for tacos, burritos, enchiladas and other dishes from Southwestern cooking. Cilantro (Corinadrum sativum) produces pungent green leaves that provide the signature flavor in many Southwestern dishes. This annual herb flourishes in the cooler months in southern states. Plant it in February and again in September for the best crop. Cilantro is a must-have herb for making pico de gallo or quesadillas. You can substitute cilantro in nearly any other recipe that calls for parsley but could use a little more attitude. Try it finely chopped in your next enchilada casserole. 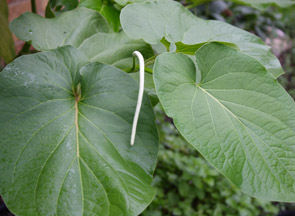 Hoja santa (Piper auritum) has large asymmetrical heart-shaped leaves about 10 inches long that grow near the top of thick jointed stalks. The roots are fairly shallow and grow laterally to spawn new stalks as much as six feet away. This native to the Southwest will grow in northern climates but must be treated as an annual. Fresh hoja santa leaves are large enough to be a wrap for foods, just as a tortilla would be used but with an added spicy flavor. Mexican oregano (Poliomintha longiflora) is a hardy shrub that grows well in the Gulf region. 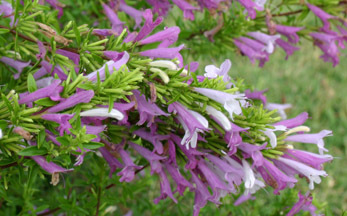 It produces inch long tubular flowers that start out white but gradually change colors from white to pink to lavender. In the kitchen, Mexican oregano leaves have a slightly hotter flavor than garden oregano. The leaves add a spicy zip to home-made salsa or pico de gallo. Also try adding it to your next chicken marinade or spice rub mix. 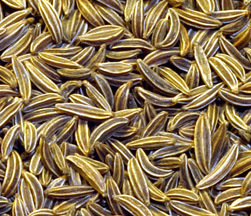 Cumin (Cuminum cyminum) is an annual that grows to only about six inches high and produces pink to white flowers that develop into the cumin seeds. Sow cumin in a pot or a corner of the vegetable garden where it will have light, loose soil. 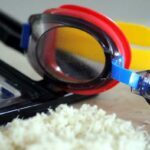 Ground cumin seeds add a deep earthy note to many meat dishes. Add it the next time you make beef or chicken fajitas. 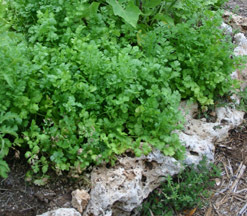 The oval leaves of papaloquelite (Porophyllum ruderale) are used in traditional Mexican cooking in the same manner as cilantro. One author describes the flavor of this annual herb as “sort of like gazpacho in a leaf, sans tomatoes.” But not everyone has this high opinion of its flavor. The Spanish name for papaloquelite is “mampuritu,” a corruption of the word for “skunk.” Sow papaloquelite seeds in a location with good drainage and full sun after danger of frost has passed. 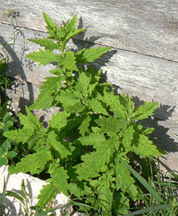 Because it can reach six feet, plant this annual herb in the back of the garden. It produces purple to bronze starburst flowers late in the growing season. Mexican mint marigold (Tagetes lucida) is a hardy perennial that works well in ornamental gardens. 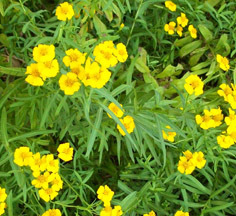 Because the leaves are used as a substitute for French tarragon I prefer to call it “Texas tarragon.” Its stems reach 2-3 feet and are topped in late fall with tight clusters of bright yellow marigold-like flowers. Plant this native in well-drained soil with full sun to part shade. Prune back in late fall after the blooms fade. Propagate in spring by division or seed. No discussion of the herb flavors of Mexico would be complete without epazote (Chenopodium ambrosioides), a tender perennial herb. Because of its invasive habit plant epazote somewhere it will have lots of sun and open space. 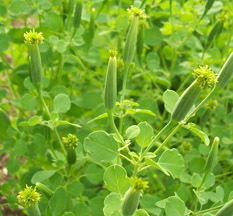 Fresh epazote has dark green serrated leaves. Epazote is often used with dried beans, corn, or fish. 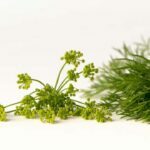 Start out using small amounts of this herb as the flavor is something of an “acquired habit” for most.